Imagine winning tickets to watch your team compete in the Super Bowl. Or being submerged in a submarine with scientific researchers you watch on television religiously. Or winning a dinner at your favorite restaurant for you and three of your closest friends. All that is exciting enough for superfans. Now imagine spending the night at these hallowed places. For consumers, exclusive overnight experiences add a level of access and intimacy that few fans can forget. But for the event marketers behind the scenes, these sleepover activations require additional strategic thinking, long-term planning and creativity. The rewards, of course, almost always outweigh the risks. “Our ceo Brian Chesky wanted to do a program that was about child-like imagination and spoke to wanderlust for travel—and the most amazing places around the world that as a kid you had hoped or dreamed of staying in,” says Christian Rongavilla, creative lead for Airbnb. The resulting brand platform, dubbed “Night At,” enables Airbnb to partner with brands and agencies to create sleepover events. 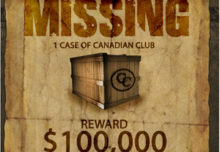 Like Taco Bell Canada, which celebrated the launch of the Steak Doubledilla with a sleepover event for a group of superfans chosen from video auditions explaining why they wanted to be part of the experience (GRIP Limited, Toronto, handled). 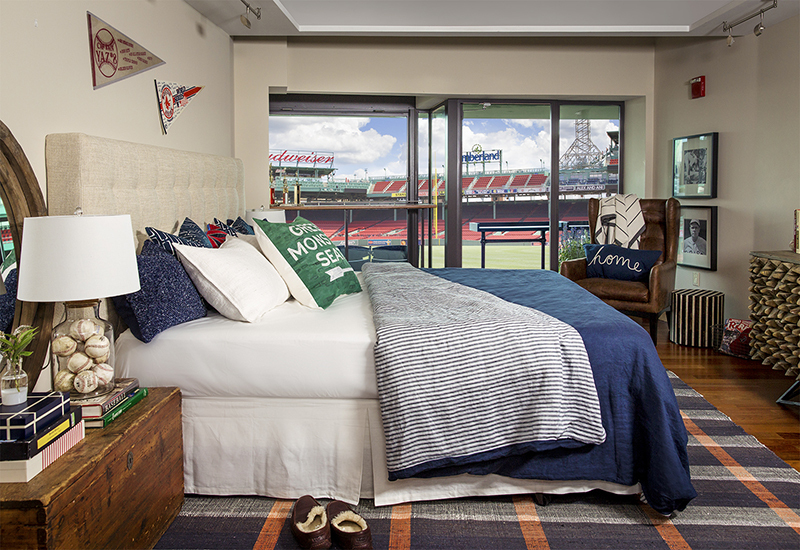 Marriott International’s Courtyard brand for the past few years has partnered with the NFL on a stadium suite sleepover contest where the winners get to wake up in the stadium on Super Bowl Sunday (IMG LIVE, Atlanta, handles). At Coachella this year, W Hotels got in on the trend by creating a glamping experience with luxury yurts, reserved for influencers and loyalty members who could bid on the experience by redeeming points. As the sleepover trend grows and consumers demand more unconventional experiences, we’re likely to see overnight events pop up in more unconventional locations. While each will no doubt pose a unique set of marketing challenges and opportunities for their respective brands, there are several insights that can help those looking to “get into bed” with their consumers for the first time. From strategic partnerships to setting consumer expectations to curating an end-to-end experience for attendees, here’s a look at five keys to a successful sleepover event. Choosing the right partners for a sleepover event can help you get important face-time with new target audiences. “For us, it’s really important to work with audiences that give us credibility or give us a new audience to speak to,” says Airbnb’s Rongavilla. Last November, the company worked with the BBC in London on a “Night At” campaign supporting season two of its “Blue Planet” series. The contest winners had the opportunity to spend three days and two nights on board the Alucia, the research vessel used in filming the show, for an active research trip in the Bahamas. Leveraging the BBC’s social media reach of 80 million people, Airbnb was able to tap into that audience while gaining access to top BBC talent. As the “Night At” platform has evolved over the past five years, Airbnb has developed specific criteria for its partnerships. The internal team looks at whether the experience can be ownable by both brands, is truly once-in-a-lifetime, will generate a big p.r. splash and has a higher meaning or larger message. Transporting a Marriott hotel room experience to either a football stadium or the California desert is an incredibly complicated task on many levels. But anticipating an overnight guest’s needs—both expected and unexpected—is another challenge altogether. 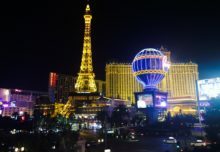 “We want to make sure that we have on hand anything that anybody could need when participating in one of our overnight activations, whether that’s amenities that you would typically find in a hotel room, snacks, or kits for whatever occasion you may need them for,” says Jennifer Utz Ilecki, vp-buzz marketing and partnerships at Marriott International. At Coachella, Marriott had an amenity tent filled with things like shampoo, sunglasses, drinks, water and Pedialite—the most requested item from partiers in the desert. They also had “intimacy kits” on hand… should anyone need them. Part of ensuring that an overnight experience goes smoothly is setting expectations about what the experience will and will not include. Honest and open communication goes a long way. “One of the key lessons that we’ve seen in social media is that if people think that an experience is going to be one way and they show up and it’s something that’s completely different, they will take to their social media accounts and make sure the world knows that they’re unhappy with the experience,” says Utz Ilecki. (Look no further than the Fyre Festival fiasco.) To avoid negative feedback of this kind, Marriott built the yurt experience ahead of time, took photos and was able to share real images of what to expect rather than aspirational ones. For the Super Bowl experience, the lucky winners still wake up in the stadium on Super Bowl Sunday. But then they’re escorted to another hotel outside the stadium to get ready for the game. “We have to make sure we are communicating with our guests early and often, so they know exactly what to expect,” says Utz Ilecki. Just as a hotel will send you a pre-arrival email to set expectations, a sleepover event requires the same. 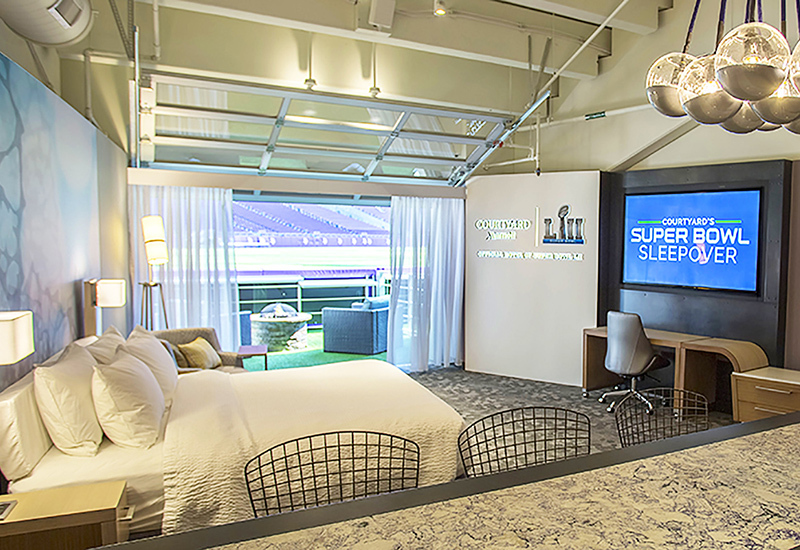 Marriott’s Courtyard brand tucks in lucky football fans for sleepovers at Super Bowl stadiums. “The host is always a huge part of the experience,” says Airbnb’s Rongavilla, who has worked as creative lead on eight Airbnb “Night At” activations, including its first. “From the moment they are announced as a winner, to the flights, to when they’re welcomed on the ground, to the transportation.” That host could be an influencer, a hired brand ambassador or a person knowledgeable about the event’s content. Throughout the evening he or she might facilitate a dinner, a meet and greet and a guided tour. The Taco Bell winners, a quartet of girlfriends, had their very own “Taco Bell Hop,” who gathered food and drink orders, answered questions, championed the games the brand had made available, and generally made them feel welcome. For white glove service at the W Hotels yurt experience, attendees naturally had access to an on-site concierge. Utz Ilecki says that successful sleepover events ultimately come down to creating an unforgettable end-to-end experience. Guiding the attendee’s journey through every touchpoint is crucial to any brand experience, but it’s even more important during a sleepover activation. “You really do have to think through every single element of the overall customer journey and the guest experience to ensure that it’s high touch and highly personalized.” And the stuff dreams are made of.